BlackBerry Curve second generation coming in September | BlackBerry Blast! According to Pinstack, a source has confirmed to them that RIM will release a second generation BlackBerry in September on the T-mobile network. 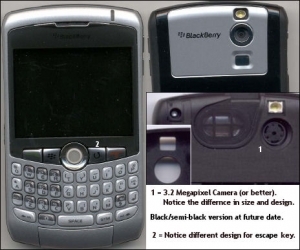 The rumored BlackBerry 8320 is said to have WiFi support and a 3.2 megapixel camera. Black or semi Black to be available at later date.